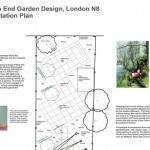 In order for me to design a garden that is unique to you, I need to know your likes (and dislikes), style and preferences for colour, texture, plants, hard landscaping materials etc. During this meeting I bring many samples and images for discussion and ask that you do the same. Some clients put together images via Pinterest or keep a list of inspirational images on Google Images. The more information you can give me at this stage the better. This is often a very exciting meeting full of enthusiasm and inspiration where many ideas are exchanged, the information gained from which is crucial in forming the basis of your garden design. The meeting usually takes 1-2 hours to complete. 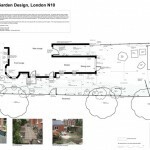 Exact measurements of your garden are needed in order for me to draw up scaled drawings of your garden design. Exact measurements of the garden including level changes, drains, access points, boundaries, window/door dimensions and materials, existing structures, trees and plants. Views in and out of the garden, both good and bad, are recorded so that good views can be maximised and bad views and privacy issues can be dealt with accordingly. Soil tests are taken to determine the ph level, soil type and structure – this helps with plant selection and whether soil improvements are necessary. The aspect of the garden is noted to show how much sun and shade the garden receives throughout the day. This affects plant selection and helps with placing areas like a sunny patio or shady seating area. Surrounding architecture and location are noted to help link the garden design sensitively into the local environment. 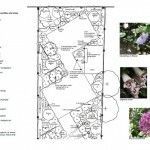 The Presentation Plan is a scaled drawing of your proposed garden design. It shows the layout in general and areas of hard landscaping such as patios, steps, pathways and retaining walls. Intended materials along with laying patterns are included as are planting areas, and other features such as water features, gazebos, containers, lighting etc. If your garden has level changes then a datum point and spot levels will be clearly shown. After the Presentation Plan has been approved, the Planting Plan is given full consideration. Areas to be screened, focal points, your plant preferences and year-round interest from planting are carefully thought about. A labelled, scaled drawing is produced indicating the exact location of every plant with its full Latin name and the quantities to be used. Images of many of the plants are shown to give a general feel of how the garden will look. 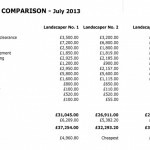 Now that your garden design is drawn up and agreed, the next stage is to obtain pricing from reputable landscapers. At this stage, you will have paid for a high level of garden design and it is extremely important that your design is implemented correctly. 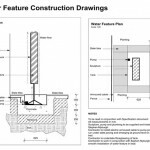 Setting Out Drawing – A Setting Out drawing shows the measurements of areas to be constructed and how they relate back to the building, along with the location of circle centres, angles for curves and clearly shows any level changes. This document enables the landscaper to quote accurately for materials and allows for precise implementation of your garden design. 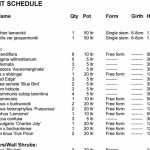 Plant Schedule – A Plant Schedule is a document that states the plants to be quoted for including Latin name, quantity, size and shape. This is necessary for a nursery to price from. Construction Drawings – If your garden design contains an unusual element such as a bespoke pergola, water feature or retaining walls, drawings showing construction methods, dimensions and materials will be necessary. 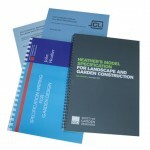 Specification – A Specification is a document that ensures quality. It has three sections: Site, Hard Landscaping and Soft Landscaping. 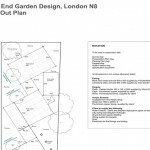 The document includes details of setting up and site constraints (such as Conservation Areas, tree preservation orders etc), details of materials and how they are to be used, plant supply and planting including lawns, soil improvements and mulch finishes. Without this document the landscaper is often left to make his own decisions that are unlikely to be in keeping with your design. For schemes with a budget over £50,000 it is in your best interests to ask three reputable landscapers to quote for your garden design construction and to ensure they are quoting on a like for like basis. I have worked with many very good landscapers over the years and can make sound recommendations if you wish. Ensure the landscapers have all the relevant documentation. Make three individual site visits to talk through the scheme with the landscapers so that they can see the site. Respond to any questions they may have via phone / email. Prepare a quotation comparison for your perusal. Once this is done, you can appoint your chosen landscaper safe in the confidence that they have fully understood the scheme and thus produced a competitive and accurate quotation. Now that a landscaper has been appointed, your garden design can become built. At this point, you will have a start date, expected build duration and therefore estimated end date. Sometimes the build will need to link in with other house works or renovation works so timetabling is a handy tool – however, as with all outdoor work, our unpredictable weather can have a hand in the best of timetabled builds. 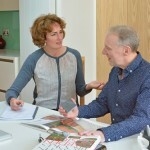 I very much enjoy overseeing the build of my garden designs and I ensure that the design you have spent your money on becomes realised to the expected high standards that I work to as a Registered Member of the SGD. I like to check the layout dimensions before they are built and I also like to check plants are in the correct place and of a high quality before they are planted. It gives me great pleasure to see my designs fulfilled to their potential and to see your financial investment in your garden design implemented to the best standards. I hugely enjoy working with architects and the client benefits enormously from the best of both professions working together. More and more architectural practices are offering clients the “total package” for both interior and exterior work thus enabling the client to move in with their garden finished too. Support for Planning Applications via overall garden scheme – increasingly Local Authorities look positively at schemes that consider the wider environment.